Below are the Pipes & Drums of the NYPD Emerald Society, one of the best pipe bands in the nation, arrayed this morning on Sixth Avenue, in front of the New York Hilton, for the annual NYPD Holy Name Society Mass and Breakfast. This annual event begins with Mass at St. Patrick's Cathedral, often presided over by New York's Cardinal, as it was this morning. His Eminence, Timothy Cardinal Dolan, was his usual warm and gracious self as he acknowledged the members of the NYPD in attendance who, with their family and friends, filled much of the great cathedral. 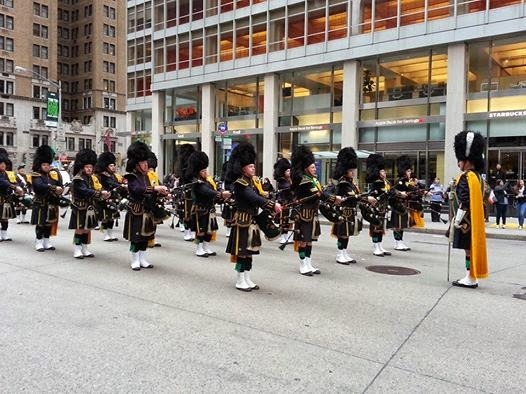 After Mass, a few blocks of Fifth and Sixth Avenues were closed to allow the entire assemblage to march from St. Pat's to the New York Hilton for breakfast, led by this very same pipe band. Last year's Breakfast featured two amazing speakers--Supreme Court Justice Antonin Scalia and former Senator James Buckley--who would have been hard to top. Nonetheless, this year's speakers were excellent, and addressed related themes. A detective from the NYPD Cold Case Squad recounted the successful investigation into the years-old Baby Hope murder case. And a nun from the Sisters of Life order described her group's ongoing battle against the institutionalized murder of babies through the abortion industry. Moving, thought-provoking, uplifting, this event, almost 100 years old, always is, and was again today. The funniest moment came from legendary talk-show host Joe Franklin, who appears at the breakfast every year, upon receiving a plaque to show the organization's appreciation. "I'd just like to say that out of all the awards I've ever received, this one is the most recent." And, yes, whenever I attend this event, I can't help but remember one of the greatest privileges I've yet had in life--attending in 1998 and hearing the late, great John Cardinal O'Connor incorporate into his homily at Mass an article I had written on the challenges and satisfactions of police work. I hope to have a copy of that homily with me at the Pearly Gates, just in case there are any quibbles about my getting in--and here's the digital version. here, for a dated but still interesting dissection of a particularly offensive Bruce Springsteen song (The New York Times).